When the people of Hamelin refused to pay the Pied Piper what they had promised, he led the children of the village away with his magical music. This key moment in a familiar fairy tale carries many insights. It is, at once, a commentary on social values, a vivid example of family tragedy, and a bit of personal psychology. Folklore is compacted wisdom literature that yields more information with each reading. There is much we can learn by reflecting on the stories heard in childhood. Magical characters such as the Pied Piper, the talking frog and the fairy godmother are likely to remain in the imagination for a lifetime. The adventures these stories describe often reflect challenges we face in our journeys. The tales hide a wealth of insights just below the surface. They are clearly more than mere entertainment for children. My own first hearing of many of the old stories was in the places where they originated. Throughout my childhood, our family traveled abroad for several months every few years. There were six children. Keeping all the kids quiet took some imagination. My parents came up with an ingenious, and life-changing, idea, which was to have us study the local tales. When we were in Denmark, we visited the home of Hans Christian Andersen, and discussed his stories, such as The Little Mermaid. In Germany, we went to the village of Hamelin, where the tale of the Pied Piper takes place. In each location, we would thoroughly examine a story and the sites associated with it. In Baghdad, it was the Arabian Nights. While visiting Greece and Egypt, we would discuss mythology. In the temples of India and Japan, the tales of Asia came to life. Seeing how the adventures reflected their settings and how the stories are still alive in those places was a powerful experience. It shaped my sense of the world. Various people can imagine the tales quite differently. I had heard the stories before and had pictures in my mind about what the places looked like. When I saw, for example, the spot in Germany where the Pied Piper supposedly led the children away, it didn't look exactly the same as I had imagined. In a way, noticing that difference made me aware of how our creativity works. It was a glimpse into the power of imagination. I later learned how these stories portray life issues in miniature. The story of the Pied Piper reminds us that every parent has to deal with letting go of their children and every former child has to cope with feelings about how it is to leave home. If we take the tale as a reflection of the inner landscape, we see that all the characters can represent aspects of our own personalities. The village leaders may symbolize a practical, thrifty side that does not sufficiently appreciate our magical qualities or artistic abilities. If we cheat the imagination of appropriate time and resources, things may go badly. Creativity and play engage the childlike energies that can leave us in a state of depression if they depart. These tales are psychological mirrors and we become more complex as we mature. The storytellers intentionally loaded the adventures with heavy symbolism to reveal more meanings as we develop a deeper awareness of ourselves. Bedtime stories have enormous influence over our identities. People identify with certain characters in the stories they heard in childhood. To some degree, many live out these stories, largely unaware of how much the old tales may be shaping our lives. It is a great treasure to know and reveal which tales from our childhood have a hold on us. Once the general pattern or storyline becomes evident, the challenge is to participate in the rewriting of our own story. We may not be able to create the rivers that carry us along but we can certainly navigate the little boats of our lives. Mythic stories make up a kind of collective dream that we all have together. If we want to understand our dreams, in many respects, we can look at these stories and study them. If we want to understand the stories better, we can study our dreams. There is a great inter-relationship between these two forms of our imagination. A talking animal in a story is often the voice of nature. Among other messages, we are being reminded that we are also animals. We are walking around in animal flesh. We sometimes forget this in our excessively mental, all too industrial culture. We are, first of all, animal creatures. We are not just visitors to nature, or merely caretakers of nature. We are nature. Guiding animals are crucial in mythic stories. Psychologically, this might well represent the wisdom of the body. Sinister or wicked characters may represent aspects of ourselves that have been neglected or rejected. 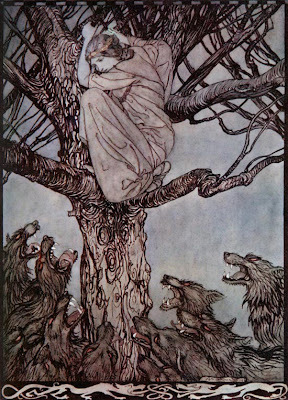 Carl Jung noted that the shadow energies in dreams and stories often appear as threatening witches or wolves. Jung insisted that something good can come from this darkness. Something valuable waits for us in the shadow. We are not to exclude that from how we define ourselves. Ultimately, inclusion is the goal. The challenge is to integrate these elements into identity in a constructive manner. The darker elements in some tales often reveal shadow energies in an action, an image, or even a setting. 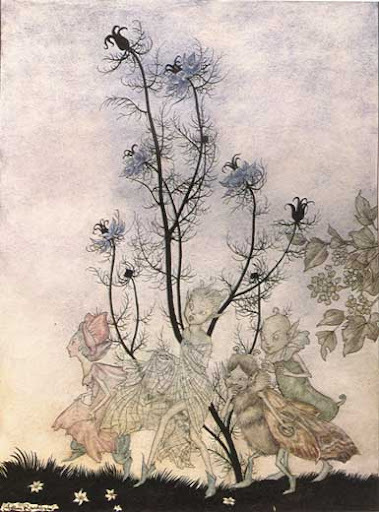 The deep dark forest is a common representation of the feared elements within. The monsters live in the forest. The forest can reflect parts of ourselves that are never entirely tamed, that are always somewhat dangerous and chaotic. These elements sometimes come up in nightmares. They are important parts of ourselves. In some ways, they are the most creative aspects of our inner world. We need to go into the dark forest. It is difficult and mysterious. Still, fresh energies and new ideas come from that place. Often we need the experiences in life that seem like setbacks and shadows. These can be difficult times. On the first reaction we wish we could avoid them. Ultimately, in hindsight, we realize those were enormously valuable moments. Such experiences force us to claim aspects of ourselves that we have neglected to develop. We become more than we thought was possible. There is a tale about a farmer who plowing in his field. Suddenly, his plow catches on something. The farmer digs down to see what the plow has snagged on and he finds it has hooked a large ring. He digs farther, gets the plow unstuck, but sees that the ring emerges from a large flat stone. After more digging, the farmer lifts the ring and the stone. As the stone rises, it reveals the entrance to a deep underground cave filled with treasures. The parable suggests that when something interrupts what we are trying to do, we should not be too sure this is a negative event. If we look into the impediment to our progress, we may open up hidden places in our souls and reveal secret riches. After discovering the buried treasure, we have the task of integrating these deep realms of beauty into our daily lives. Learning to find the guidance in familiar adventures is not difficult but does take a little effort. The starting point is understanding symbolism. Certain significant images communicate helpful information. The key is knowing how to decode the messages. The farmer getting stuck shows how trouble can interrupt our journeys for good reasons that we may not immediately grasp. The tale is a visual experience. Any one of the symbols in a classic story is worthy of a close look. If we meditate on the flow of images, and reflect on the meanings it presents to us, the rewards can be great. The ancient tales have their own lives, each with unique, eccentric qualities. Part of the richness is that the same story will have different lessons for each person who listens. Stories can be like the Holy Grail, which, when passed from person to person, let them drink what they alone desired. Also, when we come back to the same story after a time, it will tell us new things. Stories can speak to us in several ways at once. The practical aspects of our personalities appreciate the assistance they provide in prudent decision-making. Our playful child-like energies find the stories to be great fun. The quiet, spiritual side is grateful to have some time invested in reflection. Poet William Stafford had a favorite image. He said that the work of creativity is to "follow the golden thread." Something catches your attention, a feeling, an image, an idea, the events of a moment. The challenge is to pay attention to that subtle urge and follow it gently. We must roll out the golden thread with care or it will break. Opening ourselves to greater significance in familiar stories requires a certain tenderness of spirit. The notions will be fragile at first. We must hold them gently for a time until they deliver their message to us. The effects of what we learn might well last for a lifetime.